Time to start hitting some content! I have problems with vocabulary assignments. The ones from my own education that stuck with me were ones where we had to write sentences or stories that utilized the words. When we copied definitions, I didn't remember any of them. Especially when we had a giant list to define, the words slipped away from me and it became about copying out of the book. We have been told that front-loading vocabulary leads to success, I suppose. So today was a vocabulary day. In the past, I've given the students a vocab list and had them copy definitions from the book. This was a great way to fill time and the kids always did it! And then promptly lost the papers or forgot the words. This year, I decided to modify my assignment. Rather than giving every word to every student to mindlessly copy definitions, I split the class into groups of 4 and gave each group 4-5 words to master. 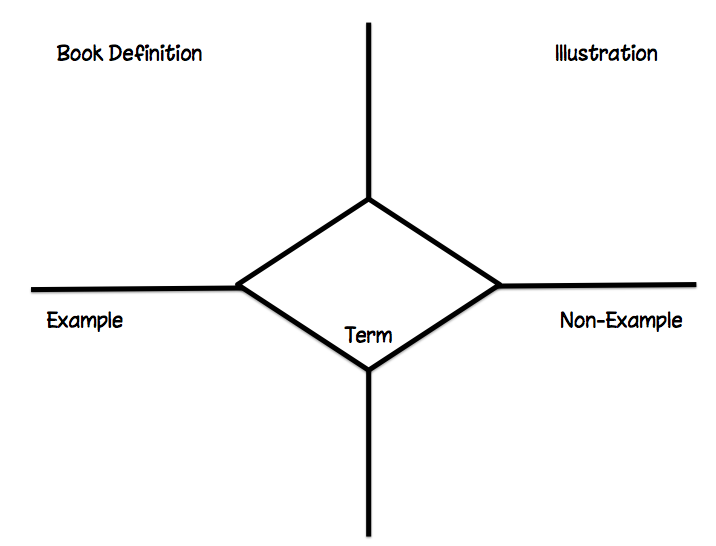 For each word, they filled out a Frayer Diagram, giving a textbook definition, their explanation or drawing of the word, examples and non-examples. The idea, I explained, was that their group would become experts on the few words that they were assigned. Then, as a class, we would discuss the answers and put the Frayer worksheets together into a book for the whole class to use. I encountered the same problem that I did last year, and the year before, and the year before. When given 20 easy tasks, the students burn through them mindlessly, learning very little. If, however, I hand them 1 complex task, they give up very easily and don't complete it. I know that it's early in the year and I'm going to have to spend time training my students on my expectations of writing and various assignments, but I am always disheartened by how little effort many of them are willing to put in. Some of the others were showing great efforts, but minimal comprehension. It's clear to me that very few teachers have asked them to define terms in their own words and they struggled with that immensely. My prompting question was "If you were telling your friend what this was, what would you say?" This worked for several students, but not all. We are at that point in the year where the students don't know what I'm asking of them and I don't know how to communicate those needs to them. I re-ask my questions in different ways, I use analogies and metaphors. I deeply struggle with meeting them where they are, intellectually, at this stage in the year. My consolation is that I know (hopefully) that it will turn out alright by the end of the year (hopefully) because it has in the past. In previous classes, students understood what I was asking of them and if they didn't do it, it's because they chose not to rather than couldn't. I believe in this activity, but perhaps I need to word my questions better. Or maybe they just need practice with it. The geometry students did a much better job with it, and it may have been because I spent more time going over my expectations. I'm going back to my thinking that students, at this level, in the advanced class are there not because they are smarter than the rest, but rather because they have consistently worked harder. The geometry students, so far this year as well as last year, show a level of persistence that I simply don't see in the pre-algebra classes. In period 8/9, the off task behavior and yelling across the room was so prevalent that I had to stop the class and assign them individual work. I talked about how I need my class to work and, while I'm perfectly fine with talking, work needs to be done as well. After that, I spent some time walking around the room and working with various students. I very quickly identified that the disturbance was coming from 4-5 kids while the rest were working VERY hard on what I asked. I made sure to let them know how much I appreciated their work. Of the 4-5 kids who were a disturbance, I corrected their behavior and then heaped praise on when they were on task. We are Pavlovian dogs at heart. If they don't have the intrinsic motivation to behave constructively, then I will give them extrinsic motivation, reinforcing what I want to see. The trick will be to not lose my patience during that training. I'm going back and forth on my thoughts on this vocab activity. I think it WILL be good, but I'm not sure I know how to make it so for the pre-algebra kids. The geometry students were invested in it and did a fairly good job. I don't know what the difference is or how to transfer that to the pre-algebra classes. Thanks for sharing I see the same things with my students. If you find something that works quickly...I was going to say be sure to share but discovering that will be like discovering gold. You'll be in demand across the nation on the miracle that helps students love to write. haha. As much as I would kill to have my students love to write, at this point, I would settle for willingness and build up to love. But if I hit on the secret, I'll be sure to sell a million books saying so! My students kept a few copies of the attached template (on pink paper) in their binders (which stayed in the room). Whenever they encountered a new word in the lesson, we would discuss a good student-worded definition, several students would share sketches, and everyone would record the exemplars. This gave relevance and ownership to the new vocabulary. It was also a simple way to modify assessments for the 9 special ed kids in the class - they were allowed to use the "pink sheets" for cumulative exams. i'm really curious what the vocabulary terms were. i'm also curious why you felt like you needed to start with a vocabulary lesson. these questions aside, i like your diagram very much -- i think it's a helpful way to conceive of definitions. An additional way to use the Frayer Model is to collaboratively create a definition. Here's one way to approach it: Create a group of four. Next, on four white boards in permanent marker write one of the four Frayer words at the top. Pass out the set of four to each group, with erasable markers. Assign the word and have students discuss their understandings and record their answers. TO confirm understanding, have the students regroup according to their one word assignment. Have students share their work and then allow them to make changes as they want. Finally, have them report back to their original group their answers and have students record in their own notebooks or on a template the completed definition assignments. As an exit slip ask each student to tell you how they came upon their response. Start training and then move away to independence. I often found with my middle school math students that my non-readers struggled the most with these kinds of tasks. Hope you have another stellar year of self-exploration and success!